I finished the MicroVisions painting this weekend, so here's the final product. I'll do another post when the auction happens in late April. Very nice! Creative design and beautiful brushwork! looks awesome, man! what was the influence behind this? I know you mentioned you were exploring a bit, just curious where the base of this image comes from. Thanks, guys. 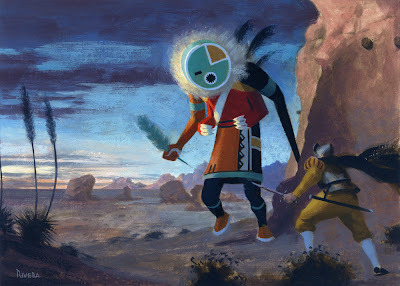 It's based on the Kachina costume and doll designs from the Pueblo tribes of the American Southwest. Once I decided on that, the idea of a cornered conquistador just popped into my head.